When is the last time you had lima beans, or were you the child who would not eat them? Personally, I always liked lima beans even as a child. This recipe suggests using the baby lima beans so you won't have to soak them prior to preparing the dish. 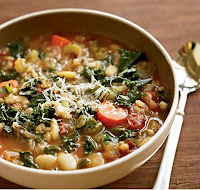 The combination of the barley and lima beans give this soup a nice thick, rich texture - a wonderful winter soup. 1. Heat 2 tablespoons of the olive oil in a 6-quart or larger pressure cooker. 2. Add the onions and celery and cook over medium-high heat, stirring frequently, until the onions are lightly browned. 3. Stand back to avoid hot oil, and pour in the broth, water, and tomatoes. 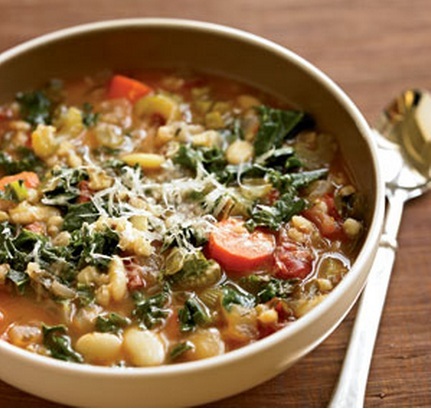 Stir in the dried herbs, beans, barley, and kale stems. 5. Lock the lid in place and bring the cooker up to high pressure (about 20 minutes on an electric burner). Lower the heat enough to maintain the pressure at high (usually a simmer), and set the timer for 12 minutes (or 15 minutes if using an electric cooker). 6. When the timer goes off, turn off the heat and let the pressure come down naturally, about 10 minutes. (If using an electric stovetop, move the cooker to a cool burner.) Release any remaining pressure by setting the cooker under cold running water. (If using an electric cooker, gradually engage the quick-release.) Very carefully remove the lid, tilting it away from you to avoid a steam bath. 7. Check the beans for doneness by cutting a few in half: They should be one color throughout. If the beans aren't fully cooked, simmer the soup uncovered a few minutes more until done. 8. Slice the carrots into chunks with a long knife. Stir well as you add the final tablespoon of oil. Season to taste with salt and enough balsamic vinegar to sharpen the flavors. 9. Divide among 6 bowls. Garnish each portion with a generous sprinkling of cheese and serve the remaining cheese in a bowl at the table. Meaty variation: Fry chicken or turkey sausage slices in a skillet while the soup cooks. After the soup is ready, stir in the slices. Brought to you by Organic Gardening.